For Daytona and NASCAR fans, this was the weekend that wouldn’t end! The Daytona 500 was primed and ready to race in the primetime Monday Night slot and very early Tuesday morning, Matt Kenseth celebrated in victory lane after winning the Daytona 500. Kenseth, who last won the Daytona 500 in 2009 because of rain, held off both Dale Earnhardt Jr. and Greg Biffle in the closing laps, to end one of the craziest races in NASCAR history. As the race was originally postponed and scheduled to run Monday morning, NASCAR made the decision to run the race under the lights later that day. Creating a buzz that will forever remind us of the 2012 edition of the Great American Race. Fans endured both rain and fire during the 500-mile race. Yes, fire. A fiery, burning inferno ignited when Juan Pablo Montoya hit a safety truck during a caution, which ended up causing a two-hour delay. Many were concerned on whether or not we would see any racing after that, since the fire seemed to destroy the entire racing surface. Who was leading during that delay? Dave Blaney, which seems only fitting as both John King and James Buescher celebrated victories over the weekend in Daytona. But just like the fans, the drivers who were still racing for the win, had some ‘fun’ while the red flag was still being displayed. Brad Keselowski took advantage of this opportunity, as he not only tweeted a picture of the fire erupting, but also engaged with both fans and media of NASCAR. Keselowski even held a ‘mini’-Tweetup with several of the drivers standing around (including Landon Cassill, Dale Earnhardt Jr., Clint Bowyer and Joey Logano). How did this prove to be beneficial for the driver of the Miller Lite Dodge? Keselowski gained nearly 100 thousand followers during the 125-minute delay. NASCAR was able to clean up all damage left behind from the jet dryer, which was holding nearly 200 gallons of jet kerosene. This prompted a 34-lap shootout, which was plagued by additional accidents. 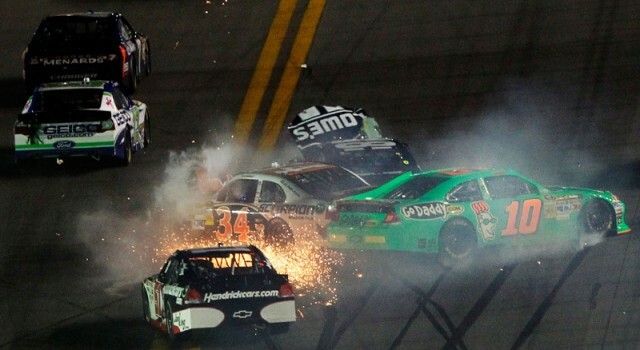 With only 22 laps left in the Great American Race, both Marcos Ambrose and Casey Mears spun, which in return set up an 18-lap race after the restart.vJust six laps later, NASCAR experienced yet another ‘big one’ – which has become a coined phrase at restrictor-plate tracks. Some of the drivers involved: Jamie McMurray, Aric Almirola, Kasey Kahne, Carl Edwards and Keselowski. Earlier in the race, however, five-time Sprint Cup Series Champion Jimmie Johnson experienced his worst career finish in the race. He wrecked on the second lap, long before his car was able to reach full speed. Johnson finished 42nd, in the 500, which is his worst finish in 53 starts at the infamous track. But here’s the real kicker – since winning the Daytona 500 in 2006, Johnson has finished 39th, 27th, 31st, 35th, 27th and 42nd in the race. ‘‘I’m just really, really bummed to start the season this way,’’ Johnson said. ‘‘For all the hard work that has gone into getting ready for tonight, we didn’t get to complete 21/2 miles of green-flag racing.’’ In Johnson’s defense, he had very little control over his early exit in the famed race. As Elliott Sadler nudged Johnson from behind, the 48 machine turned into the wall collecting several others. David Ragan slammed hard into Johnson’s spinning car.